If designed properly, an aquarium can represent the centrepiece of any home. 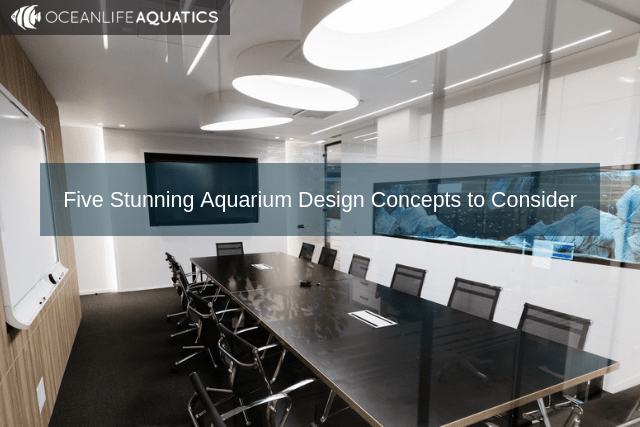 This is why there are a host of unique aquarium design options to choose from. Let’s examine five stunning examples as well as what each entails. In-wall aquariums are quite popular due to the fact that they will not take up additional space. They can be mounted flush to the surface and this aesthetically seamless nature appeals to many individuals. Hexagonal tanks first made their appearance in the 1980’s and they have been popular ever since. These free-standing units will certain draw positive attention and the panes of glass provide a unique three-dimensional view of the internal contents. Why not wash your hands in style with this one-of-a-kind concept? Aquarium sinks will literally replace a standard basin in the form of an acrylic tank. If you have been hoping to add a bit of flair to your existing bathroom, this idea is worth a closer look. Coffee tables are often taken for granted due to their functional nature. This is why including a fish tank support could be an interesting departure from the norm. Reputable design specialists such as those found at Oceanlife Aquatics will provide you with a number of options to choose from. This helps to ensure that a standard table will be taken to the next level. We should also mention that such an idea represents an unforgettable conversation piece! This final idea involves a certain amount of “retro” appeal. Do you have an old CRT television gathering dust in the garage or the attic? If so, you would be surprised to learn that such an ancient unit can be transformed into a modern and stylish aquarium. The conversion process is rather straightforward when working with trained technicians and it can be argued that staring at fish will provide more satisfying entertainment than the majority of programmes currently being broadcast. These five ideas are merely meant to scratch the surface and to whet your appetite. There are literally countless other concepts to consider in order to provide a stunning addition to your environment. If you would be interested to learn more about the services that we provide as well as the options at your disposal, please contact our team at your convenience.